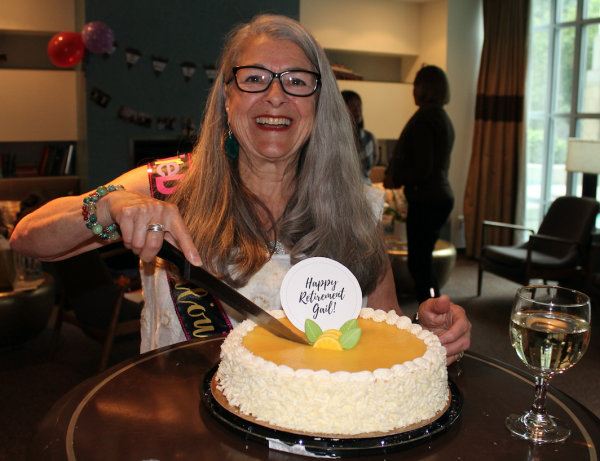 Colleagues and friends of CCWS Regional Coordinator Gail Edinger gathered together on June 7th for a retirement party to celebrate her many contributions to anti-violence work over the years and to wish her well on the road ahead. Many long-time colleagues took the opportunity to remember times with Gail and speak about what she meant to them, often mentioning the impact she had on their understanding of anti-violence work and her incredible ability to forge relationships: EVA BC Executive Director Tracy Porteous, Metro Vancouver Transit Police Chief Doug LePard (formerly Deputy Chief of the Vancouver Police Department), Victoria-based lawyer Diane Turner, MOSAIC’s Ninu Kang, Dr. Harry Stefanakis, Sarah Leavitt, RCMP C/Supt. Dave Attfield and Sgt. Stephanie Ashton, Setsuko Hirose, and Sashi Assanand, founder of Vancouver and Lower Mainland Multicultural Family Support Services. And yes, there was cake! Many are the ways in which you have advanced societal knowledge to a place of higher understanding of the realities of Violence Against Women. Many are the people whose lives have been altered and healed by the direct results of your deep interest in this work to which you have dedicated years of your time, efforts, understanding, and expertise. It is a grand privilege to observe your knowledge and your dedication to moving ahead through your efforts in this work and your awareness of what needs to be done. Now, at this time of your leaving your beloved group of colleagues, I write to wish you well and to acknowledge and thank you for the difference you have made in so many lives through your splendid work. Your accomplishments shine a bright light for others to follow, to learn and understand the seriousness of the need to stop all violence against women and children. It is with mixed feelings that I write to say good bye. 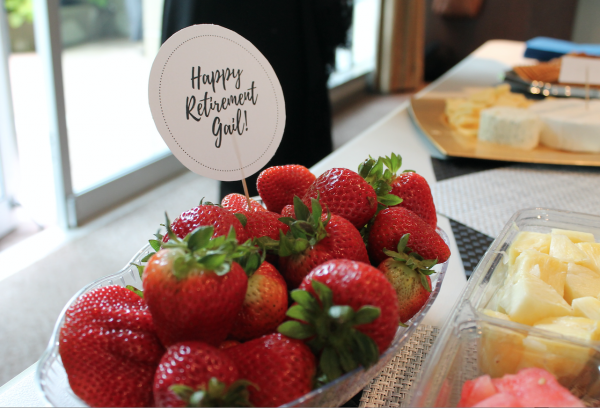 I am retiring as of June 27th, 2018! EVA hosted a wonderful party to send me off, and am now just tying things up to pass on to the new staff who will be replacing me. I have loved this work, and my wonderful mates at EVA BC. I have loved meeting all of you. As you all know, the work will always be there, yet women will be safer and more respected because of what you do. Some will stay, and some will leave; but every one of them will know there are options, because of you. Coordination is no less important now, than it was 25 years ago. If you are involved in VAWIR/VIR or sexual assault coordination initiative, you are on the cutting edge of change in your community. Keep your passion for local social change on violence against women. The possibilities for a safer community are real. Your relationships at your coordination tables, and in your work with your partners will always be the touchstone for realizing those possibilities. Make them your priority and women will be safer. Thank you for everything you do to improve safety for women and their children. Thanks for being there, to witness, to inform, to lend compassion and hope to survivors. Thanks for always wanting the response to be better, for wanting abusers to change, for wanting families to be able to stay together safely. Thank you for your care and compassion and commitment.